I have spent my entire professional life in the electronics industry, mostly on the consumer side. I love electronics. It’s exciting to see new technologies enter the market and evolve. I was a part of the explosion of the consumer electronics industry for many years, and participated first hand in the introduction of some magical and game changing products. In my transition to the professional and industrial segment of the industry, one subset of the industry immediately caught my attention. That is digital signage. Digital signage combines all of the elements of electronics into one product, and makes the possibilities endless. Combining hardware, firmware, IT, content management systems, and actual content is a challenging task, that when done right, will produce astounding results. Digital signage can be very altruistic, in that will improve people’s lives in many ways. It touches everyone in the chain, including hardware manufacturers, software programmers, IT experts, content creators, systems integrators, and end users. The finished product makes information easier to find and understand. There will be no more getting lost in the mall, or wondering what the suggested use of a product is. This all may sound a bit overstated, and even a bit corny. But after the research I have done over the past two years, I believe that digital signage will breath life into a challenged industry. So many other segments of the electronics industry are in the mature stage, with limited growth capability. Digital signage, on the other hand, is in the beginning stages of a growth explosion. From the largest billboard, to the smallest conference room sign, electronic signs are taking the place of paper everywhere. The topic and product line I have staked out is the small format digital sign. My definition of small is the under 25” category. These will become standard infrastructure items. Screens are starting to appear on store shelves for advertising and product information. They are being used as room signs on school campuses, corporate campuses, hotels, and transportation hubs. They can be passive, or fully interactive with touch panel. They can be as small as 4”. They can be standard consumer products, or industrial quality. The digital signage industry has tended to pay particular attention to the large screen products up until now. This makes perfect sense. They are more exciting to work with, and create an instant impact when employed. However, the small screen is becoming more and more in demand as the end users see their applications. Because of the limited demand up until now, the selection of products offered in the small screen size is limited. As the demand grows, more and more manufacturers will develop products in these sizes. In my presentation, I will detail what is currently available in the static, small screen sizes. As opposed to the large screen format, there are acceptable uses for consumer products in small sizes. I will give my recommendations of where consumer products are acceptable, and where industrial products should be used. Digital signage will have a profound impact on the industry for many years to come. It behooves the industry insider to know as much as they can about the process of integrating digital signage into infrastructure projects. I look forward to meeting you at DSE 2012. Perry Goldstein is a veteran of the electronics industry. He is a specialist in retail activities, including store displays and in-store events, working on both the hardware and content side of the business. 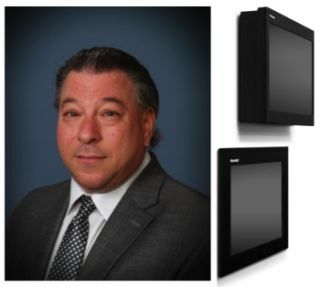 Perry is the Sales & Marketing Manager for Marshall Electronics, heading their Digital Signage and MXL microphone divisions, and is the co-developer of the Marshall Digital Room Sign.